“Men Firing up the Runway” drew a 150-plus-member audience that enjoyed a rollicking good time while collecting food items and raising funds for the local food bank. “The church wanted to do something for the community, to embody generosity for our neighbors,” said Rev. Tim Smith, pastor, adding that the price of admission to the show was a food item for donation. “Also, this event was perfect because we are being intentional about planning events that are fun!,” said Rev. 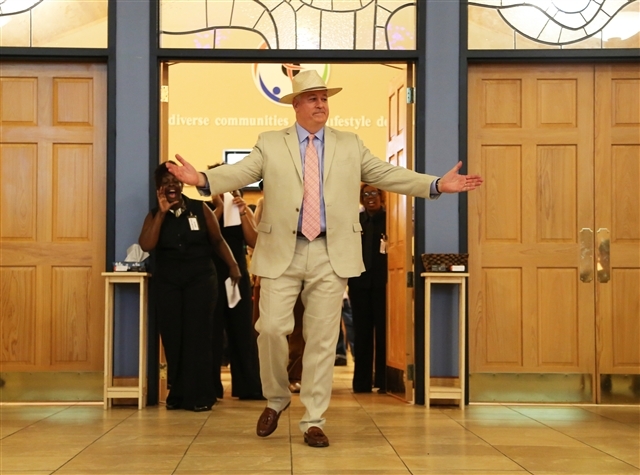 Smith, who added that the event “was the most entertainment I’ve had in any two hours during my 25 years of ministry.” He credits Adrain Vaughan, worship leader for the church’s Mosaic service, for coming up with the idea of the fashion show and for making it become a reality. As the men strutted down the runway, some audience members actually threw dollar bills toward the models. “That was hilarious and unexpected,” said Rev. Smith, who said that the money was collected and donated to the food bank along with the canned and dry items. Perhaps the most endearing model was an adorable toddler who seemed to wave to the audience on cue as he was carried down the runway. Several of the models were members of a Gretna UMC Sunday school class comprised of residents of Responsibility House, a local halfway house for former drug addicts who have been incarcerated. “They really enjoyed being a part of this event. We are pleased that these men have adopted our church as their spiritual home,” said Rev. Smith.